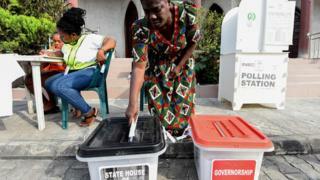 Work for di govnorship and state assembly elections for Rivers State neva finish as di Independent National Electoral Commission INEC say for Monday 1 April, dem go release di way dem go take do di collation of results wey suppose start from 2 to 5 April. INEC Administrative Secretary for Rivers State, Elder Etim Umoh say INEC don already collate result for 17 local goment areas but e remain six local goment wey dem neva collate result. Di 17 local goment na Ahoada East, Bonny, Akuku Toru, Obio-Akpor, Ogba/Egbema/Ndoni, Omuma, Port Harcourt and Ikwerre. Odas na Emohua, Tai, Opobo-Nkoro, Andoni, Eleme, Etche, Ogu Bolo, Oyigbo and Okrika. Di Administrative Secretary say results from dis areas dey for INEC strongroom and dem neva touch am. Di six local goment wia dem neva conclude di collation na Khana, Asari Toru, Degema, Ahoada West, Abua/Odual and Gokana. INEC bin suspend di electoral process for 10 March sake of violence and harassment of INEC officers as dem dey collate di result. But activities don already start again wit di stakeholders meeting wey di INEC National Commissioner wey dey supervise Bayelsa, Edo and Rivers State Mrs. May Agbamuche-Mbu hold wit stakeholders for Port Harcourt. She say dem go do di collation and announcement of results in a transparent way but she say dem no sabi who dey win but all di results dey intact for INEC hand. According to di timetable wey INEC release for 1 April, di national office for Abuja go bring out di details of how dem go take collate results for di remaining local goment. Den from 2- 5 April, dem go open di collation centres to continue di collation and and announcement of results. If e get areas wia dem need to do rerun election, INEC don keep Saturday 13 April as di day dem go do any kain rerun or supplementary election for wia e suppose hold. Den from 13 - 15 April, dem go announce results of all di supplementary election dem do but latest by 19 April, INEC go give all outstanding certificate of return to pipo wey win di elections. Dis one also include di supplementary election wey dem do for House of Reps and Senate.